Description: Gayle Christopher was a Special Education teacher-Speech Therapist in all of the Oconee Schools during her career. She began her career in Oconee County in the early 70's. In 1976, she married Jimmy L. Christopher (OCHS Class of 58), Oconee County Tax Commissioner. Both have been active in Community and Educational activities for years. 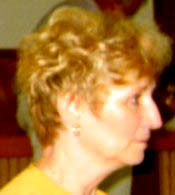 Gayle Christopher retired in 2001 and then taught, part-time, in Athens-Clarke County.